Besides my love for listening to and writing about music, I also love playing it. I've been a guitar player since I was 10 years old and began writing and recording my own songs around the age of 15; it's something I still do today. I also played trumpet for a dozen years and sang in choirs and choruses, and I can play bass guitar, drums, and I dabble in piano. But by far, guitar is my primary instrument, which is what makes the above pictured guitar so special to me. My entire family came to America from Greece. On my mother's side, my grandmother is the child of Greek immigrants, and my grandfather came to the USA from Greece after WWII as a teenager. On my father's side, both of my grandparents are children of Greek immigrants. This guitar is from my paternal grandfather's family. My Papou John was the middle of 3 sons; he had an older brother George and a younger brother Alex. They grew up in the Bronx in New York City in the 30s and 40s until the time of WWII when they moved to the New Hampshire seacoast, which is where my Papou met my Yiayia and they settled (and our family is still here). Prior to that, my uncle George was in the Navy in WWII and was killed in the English Channel when his ship was hit by German U-boats. (My Papou also served in WWII, in the Army, and saw combat in Europe and had actually shipped out to San Francisco for the planned Allied invasion of the Japanese home islands after Germany was defeated. He was waiting on the West Coast to go across the Pacific when the atomic bombs were dropped and the war ended. My uncle Alex is also a veteran, having served in the US Coast Guard after the war...I'm very proud that all 3 of them served our country!). So how does that little bit of family history tie in to the guitar above? Before he went into the Navy, my uncle George worked at the Epiphone guitar company. 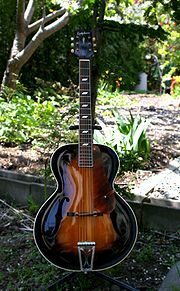 For anyone who is not familiar, Epiphone was a company founded in the late 1800s by Greek immigrants and had their factory in Queens, New York City. They moved their operations to Philadelphia in the early 1950s, before being bought by the Gibson guitar company in the late 50s, whom they are still owned by to this day. Prior to WWII, my uncle worked there building guitars (makes sense, since the company was owned by Greeks and he was Greek-American). My grandfather told me when he first showed me the guitar when I was ~13-14 years old (1993/94) that George built this one for himself during his off-hours and after he was killed in the war, my grandfather held on to it. I only ever saw it that one time but being a guitar player myself, over the intervening years I had always had the thought in the back of my head of trying to fix it up and play it. My Papou and my uncle Alex sadly both passed away in 2009 (and both are sorely missed by all of us) so I never got the chance to ask more about the story behind this guitar. My Yiayia was clearing out a bunch of things from her house and I remembered this guitar and asked if I could have it, and I'm very thankful that she and my uncle Greg (her son and my dad's brother) passed it along to me. When I got it home a few weeks ago, I wasn't sure what to expect when I opened the (original!) case since I'd only gotten that one glance at it 20 years ago and otherwise, it'd been sitting in its case for decades, but I was really surprised at what I saw! Other than some general (thick) dust on the body, there's not much wrong with it other than the binding coming removed from the body in a few spots (and the old glue residue getting tacky and picking up bits of fuzz from the case lining). Otherwise, the neck and fretboard are straight and true and I saw no sign of warping or bowing. It seems that I should be able to get it back to normal with just some careful cleaning and reattachment of the binding. I did a bit more research and found the original sticker still on the inside of the body, by looking through the lower f-hole. 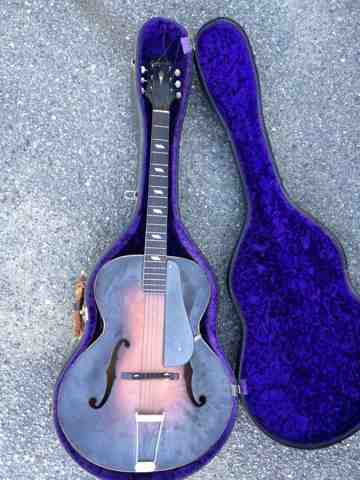 It says "Epiphone Blackstone Masterbilt" which is the model. It also has the serial number, and underneath "MADE IN NEW YORK CITY." I did some internet sleuthing and found an Epiphone serial number database which dates the guitar to 1938. Some other sites also date it to '38, but one says it was made in Philadelphia. I don't buy this for 2 reasons: 1) Epiphone didn't move their operations to Philly until the early 1950s, and my uncle died in WWII some time around 1942/43; 2) my family has documentation that he worked at Epiphone, and when he died he was around 19 or 20 years old and definitely lived in the Bronx with his brothers and their dad...I don't think he ever went to or lived in Philly. Once I can carve a little bit of time out after we are settled from our recent move across town, the plan is to clean it, reattach the binding, put on new strings, and play it! I can't wait to hear how it sounds, and to see how it looks in its original state. But more importantly than that, it's a part of my family's history and to me, that's the most important thing.